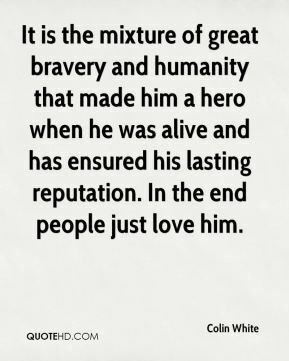 It is the mixture of great bravery and humanity that made him a hero when he was alive and has ensured his lasting reputation. In the end people just love him. [An example: People want to be remembered for great things, such as contributing to humanity, he says. Not him.] 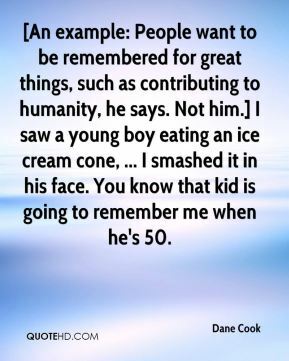 I saw a young boy eating an ice cream cone, ... I smashed it in his face. You know that kid is going to remember me when he's 50. 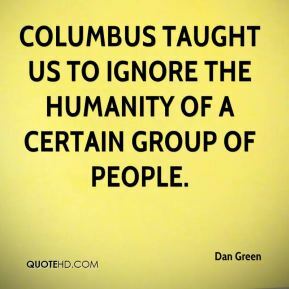 Columbus taught us to ignore the humanity of a certain group of people. 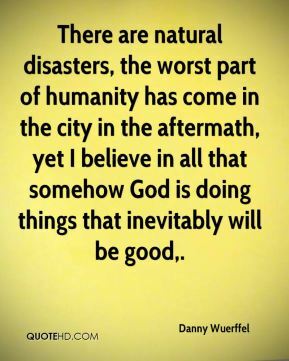 There are natural disasters, the worst part of humanity has come in the city in the aftermath, yet I believe in all that somehow God is doing things that inevitably will be good. 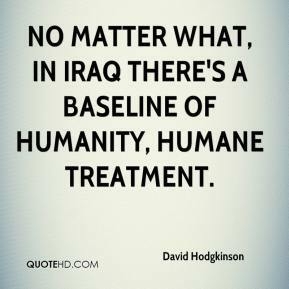 No matter what, in Iraq there's a baseline of humanity, humane treatment. The influenza pandemic of 1918 may well be the greatest scourge ever to afflict humanity, exacting a death toll greater than all the wars of the 20th Century combined. The virus that wreaked this havoc apparently developed in birds, and then jumped to people. 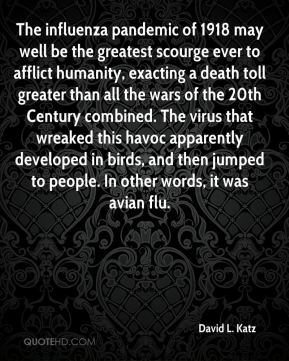 In other words, it was avian flu. (Habitat for Humanity) is working on a three-state program down there, once the time comes, to build housing for the poor, ... 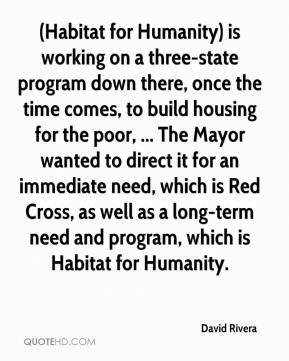 The Mayor wanted to direct it for an immediate need, which is Red Cross, as well as a long-term need and program, which is Habitat for Humanity. 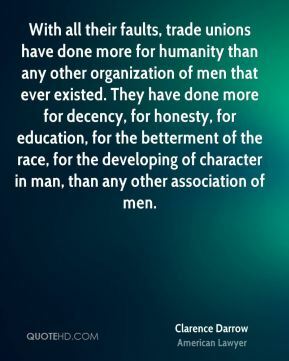 We wanted to emphasize his humanity. 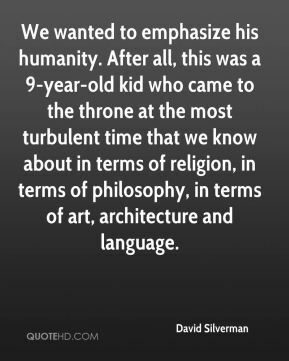 After all, this was a 9-year-old kid who came to the throne at the most turbulent time that we know about in terms of religion, in terms of philosophy, in terms of art, architecture and language. 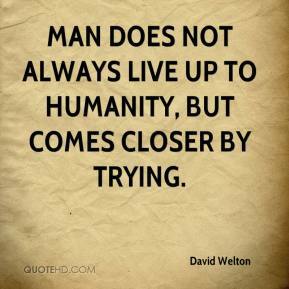 Man does not always live up to Humanity, but comes closer by trying. 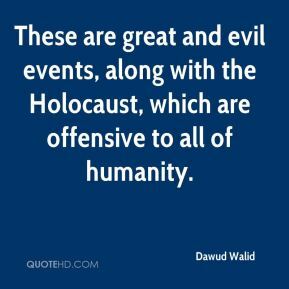 These are great and evil events, along with the Holocaust, which are offensive to all of humanity. 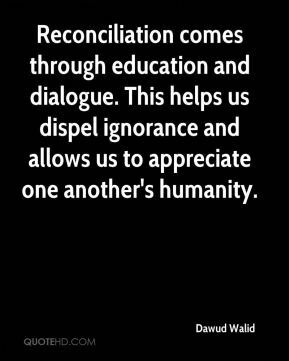 Reconciliation comes through education and dialogue. 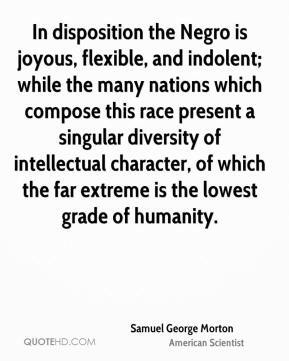 This helps us dispel ignorance and allows us to appreciate one another's humanity. 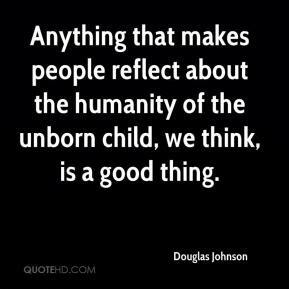 Anything that makes people reflect about the humanity of the unborn child, we think, is a good thing. 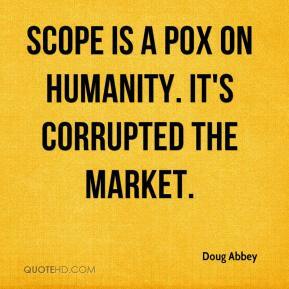 Scope is a pox on humanity. It's corrupted the market. 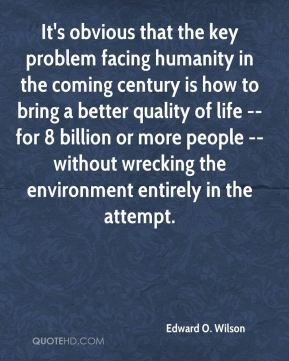 It's obvious that the key problem facing humanity in the coming century is how to bring a better quality of life -- for 8 billion or more people -- without wrecking the environment entirely in the attempt. 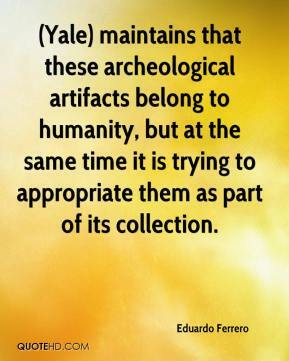 (Yale) maintains that these archeological artifacts belong to humanity, but at the same time it is trying to appropriate them as part of its collection. 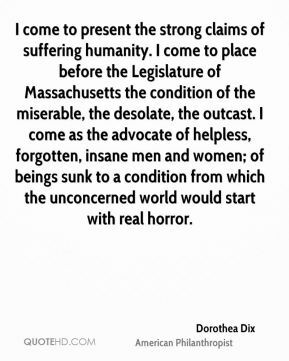 Alas, how strong a family likeness runs through blind and persecuting humanity in all Dimensions! 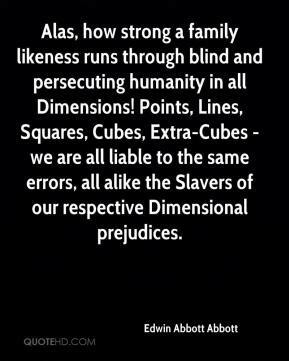 Points, Lines, Squares, Cubes, Extra-Cubes - we are all liable to the same errors, all alike the Slavers of our respective Dimensional prejudices. 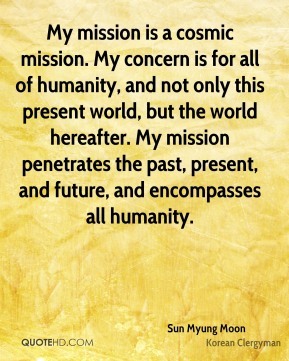 The future of humanity depends on this part of the world. 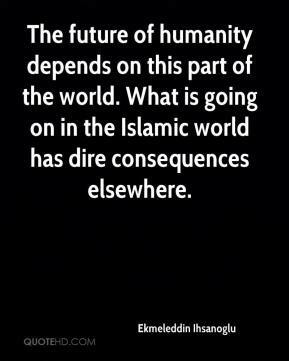 What is going on in the Islamic world has dire consequences elsewhere. Science is not marginal. Like art, it is a universal possession of humanity, and scientific knowledge has become a vital part of our species' repertory. 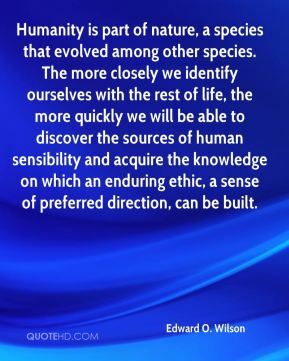 It comprises what we know of the material world with reasonable certainty. . . . 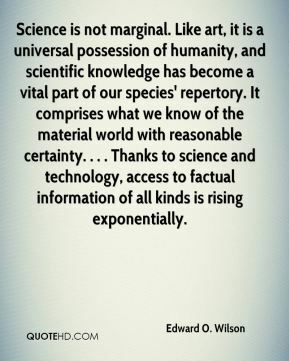 Thanks to science and technology, access to factual information of all kinds is rising exponentially. 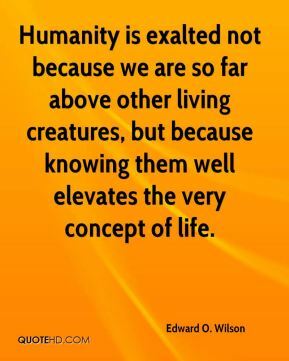 Humanity is exalted not because we are so far above other living creatures, but because knowing them well elevates the very concept of life.